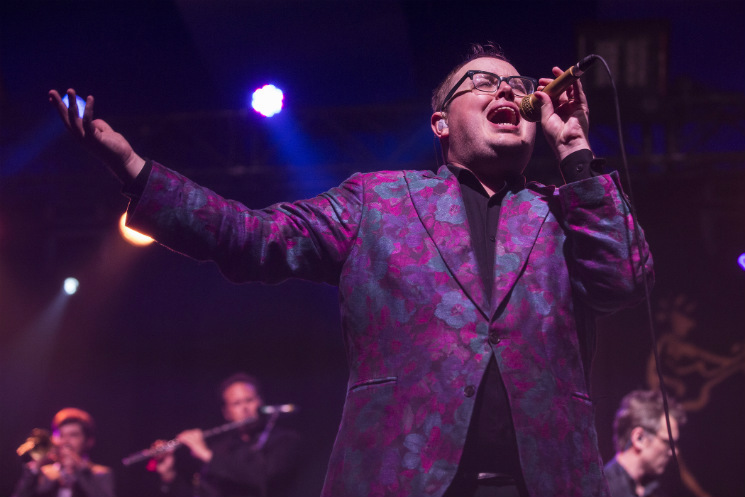 It was a bittersweet moment for many as St. Paul and the Broken Bones took to the main stage, as it marked the final act of the 38th annual Edmonton Folk Festival. For the devoted concertgoers who braved a torrential downpour to catch the act from the Birmingham, Alabama, St. Paul and the Broken Bones' set would turn into a soaked and muddy dance party that would be remembered for years to come. As if it had been choreographed, the skies opened and the rain slowly intensified while matching the band's intro onto the stage. Lead vocalist Paul Janaway entered the stage wearing a bright yellow rain coat, which was promptly ripped off with a few sensual dance moves and thrown off the stage, revealing his bright floral suit jacket. St. Paul and the Broken Bones are not only a large band in regard to members, but also in sound. The wailing brass instrument section, fronted by Janaway's robust and commanding vocal talents, did wonders, while the groovy bass licks of Jesse Phillip and the lively drumming of Andrew Lee held down the soul rhythms. The contagious beat of St. Paul and the Broken Bones' songs kept the mood of the audience members uplifted through their performance. After the first day of the festival was ended early due to harsh weather, it seemed almost fitting and poetic to end the festival with patrons dancing and singing in the pouring rain.